Performing ERP version upgrades is known to be challenging. So much so that it’s become common for companies to avoid upgrades as much as possible. There are a wide variety of reasons cited for why such upgrades can be so challenging, costly, and disruptive. A common root cause is that an upgrade by definition is the change of an existing state. Any change introduces risks of functionality that used to work one way now working in a different way. It takes time and effort to learn what the changes are, conduct impact analysis with integrated systems, review customizations, and figure out a plan to perform the upgrade. Users must be trained on the new functionality and changes to existing ones. Setting up testing environments and conducting user acceptance testing can be costly and time consuming as well. Additionally, the overall upgrade process and project duration can easily become unpredictable, and at times feel circular or repetitive in nature — as you find challenges with an upgrade, you address the area of challenge and you start the process all over again. The complexities associated with conducting successful upgrades require careful planning and execution. Short-cuts lead to difficult experiences that are hard to forget. It’s understandable why such experiences and challenges all lead to “upgrade avoidance” and an “If it ain’t broke, don’t mess with it” perspective. However, what businesses often do not consider is that avoiding upgrades requires far more effort and is costlier overall. When a business decides to skip a major upgrade, the costs and effort associated with the upgrade is simply deferred, not eliminated. The cost and effort involved with the next upgrade is then multiplied as the effort, impact, and complexities have become much larger than they were before. This deferral can be thought of as the company’s growing Technology Debt. With each deferral of an upgrade, the company’s technology debt compounds exponentially until it reaches a point where the cost to perform an upgrade is no longer affordable or sensible. It is well documented that performing frequent and smaller upgrades is significantly less costly overall. Studies have also shown that a top reason businesses switch ERP systems is the fact that upgrading a badly outdated version can outweigh the costs of implementing an entirely new ERP system. The risks associated with avoiding upgrades must not be overlooked. Businesses that skip upgrades quickly end up on unsupported versions of the software and expose themselves to significant risk. Should a newly discovered critical software issue or security vulnerability arise, updates and solutions are only available for the supported version. A business on an unsupported version could also find themselves facing a real dilemma: should they perform a highly disruptive, costly, and unplanned emergency upgrade to address the issue or learn to live with that issue (assuming it has not halted their business). Businesses must also keep in mind that outdated versions are a fishing ground for cyber criminals, potentially putting business information at risk. Compliance can also be a significant factor and reason to stay current on upgrade releases. Most compliance requirements and certifications are issued based on the current version of the software. As compliance regulations change, so must the software. These changing regulations include SOC1 and ISO27001, for instance, and if a business has compliance needs, staying on a current version is essential. Remaining on older versions also separates a business from the community norm. Community collaborations for old versions get little or no attention. Troubleshooting challenges you face become harder to diagnose and solve. Resources you used to rely on to help you become increasingly scarce. This is why we encourage all Acumatica customers (new and current) to get on to Acumatica 6. Read about the ease of integration here. Missing out on functionality improvements should also be a concern. New versions of the software bring functionally enhancements that a company can take advantage of to improve productivity, reach new clients more effectively, or service and grow existing ones in new ways. This can be a clear competitive advantage for the many companies using modern solutions versus those companies still running on old versions or technologies that cannot offer the new functionality or innovations contained in upgrades. 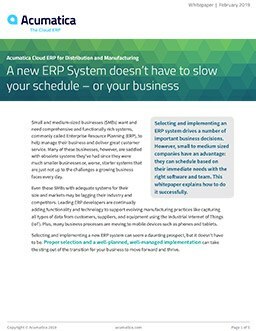 See why having a complete ERP solution is key for your business. Ultimately, avoiding upgrades requires more effort, is costlier, riskier, and limits the business. Businesses must instead protect their ERP system investment through a small, frequent, well planned, and executed upgrade regimen that helps them stay on current and supported versions. For more information on how Acumatica manages its Product Support Life Cycle, current customers and partners can go here. You can also contact your Acumatica reseller for more information and guidance specific to your unique situation. For people new to Acumatica and interested in learning more, please contact our team here.